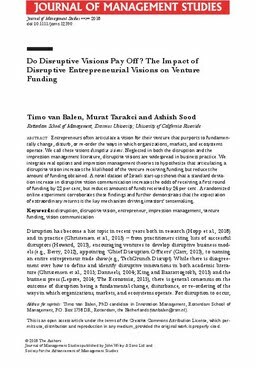 RePub, Erasmus University Repository: Do disruptive visions pay off? Do disruptive visions pay off? Entrepreneurs often articulate a vision for their venture that purports to fundamentally change, disturb, or re-order the ways in which organizations, markets, and ecosystems operate. We call these visions disruptive visions. Neglected in both the disruption and the impression management literature, disruptive visions are widespread in business practice. We integrate real options and impression management theories to hypothesize that articulating a disruptive vision raises expectations of extraordinary returns, which in turn increases the likelihood of receiving funding, but reduces the amount of funding obtained. A novel dataset of Israeli start-ups shows that a standard deviation increase in disruptive vision communication increases the odds of receiving a first round of funding by 22 percent, but reduces amounts of funds received by 24 percent. A randomized online experiment corroborates these findings and further shows expectation of extraordinary returns as the key mechanism driving investors’ sensemaking.